Learn more about SPU’s low-residency MFA program at spu.edu/mfa. 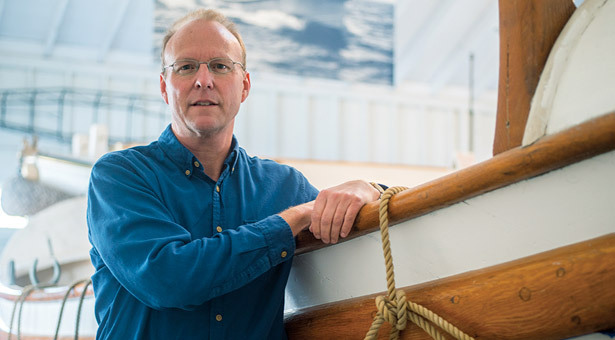 Michael McCarthy, MFA ’11, did some of the research for Ashes Under Water at the Michigan Maritime Museum in South Haven, Michigan — one port of call featured in the story. It was July 1915 when a boat docked in the Chicago River rolled over, spilling its passengers, electric company workers on their day off. More than 800 people drowned that day. Everyone pointed fingers at others and in the end, the courts assigned no blame, despite evidence that the boat lacked the stability to carry the number of people on board that day. It took 12 years to put those answers together in a book, Ashes Under Water: The SS Eastland and the Shipwreck That Shook America. This summer, it hit The New York Times bestseller list. McCarthy, like many poets, came to the genre through an interest in the heart. In his case, though, it was the actual muscle. One of his final stories of his 22-year career at the Journal was about a new stethoscope developed because the hospital din made it difficult for doctors and nurses to hear a patient’s heart beat. He left journalism shortly afterward, in 2006, for an MA in English at Chicago’s DePaul University. While there, “I really just fell in love with poetry,” he says. McCarthy is a devout Catholic, so many of his poems were infused with faith. An instructor at DePaul suggested he submit them to Image, a quarterly literary journal housed at SPU. McCarthy got a rejection letter that sparked his interest in the University. In 2009, Seattle Pacific’s MFA program accepted him to the program to focus on poetry. For the two-year, low-residency program, students from across the country work at home, reading, analyzing, and writing, and submit their work to long-distance mentors. They meet for two 10-day residencies each year, on Whidbey Island and in Santa Fe, New Mexico. Jeanne Murray Walker, a poet and English professor at the University of Delaware, has worked as a mentor with the University’s program for the past decade. She says McCarthy’s journalistic background showed in the analytical works he produced during his time with the program. But he also grew as a poet, focusing on writing devices like metaphor — skills visible in Ashes Under Water. McCarthy is now writing from his home in Michigan. His current projects include poetry, some of which he has published in The Southern Review, a quarterly literary magazine.